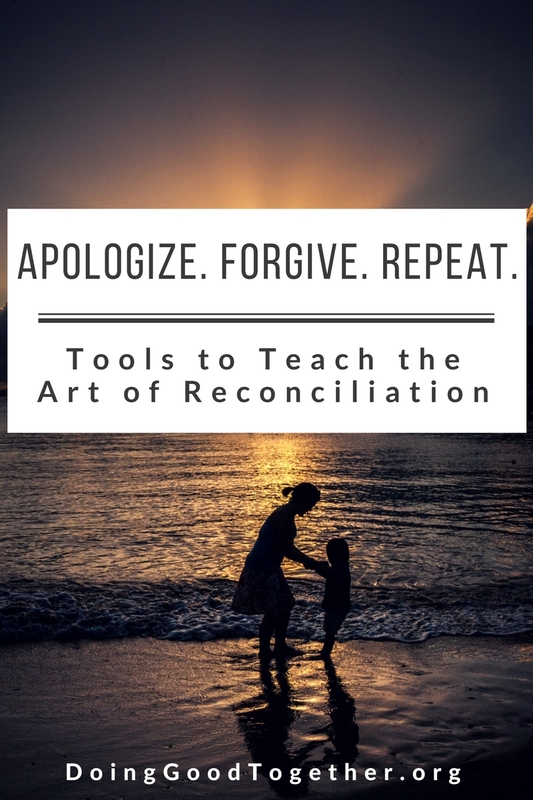 In our efforts to raise compassionate children, let's not neglect the art of reconciliation. By teaching children how to thoughtfully apologize and forgive when they are young and their conflicts are relatively straightforward, we will set them up for a lifetime of more mindful relationships. Sure, science says reconciliation skills are crucial, making us healthier, less stressed, and more resilient. But so does personal experience. I had one of those parenting moments yesterday, one of those moments that you wish you could rewind. Our morning routines were crawling along. One kid wouldn't get out of bed and the other had decided he couldn't be alone in any given room at any given time. I was running back and forth trying to move things along, all the while considering what would happen to my own schedule if we somehow missed the bus. Then I heard a crash down the hall. I could hear broken glass hitting the floor. In the midst of all the chaos, Mr. 6-year-old had gotten goofy and thrown a blanket down the stairs, which collided with the decorative candles on the landing below. Even before I joined him on the stairs, I could hear his little voice stammering, "I'm sorry! I'm sorry! I'm sorry!!" Quick assessment: the hall below is covered with glass; we're all barefoot; we're already ten minutes late for everything; the bus is a lost cause. At that point, I said some words. As you might imagine, they weren't my most compassionate parenting words. As soon as his face collapsed into tears, my frustration drained away. The schedule didn't matter. The broken candles certainly didn't matter. The dreaded ten minutes were nothing. I was so sorry I had overreacted. But I'm only human, and I've been there before. Surely, I'll be there again at some point. From my many years of practice, I knew what needed to come next. While his tears slowed down, I snuggled next to him on the stairs. I explained what was going through my head and my heart in that moment: stress and frustration. And I let him know what I wish I had done instead. What I'll try to do better next time. "I forgive ya," he hugged me. Of course, I had to prompt him to apologize for the crash, but then he did admit that he had broken a rule. He even explained why: "That blanket goes downstairs. I was going to put it away." Once we understood each other, we were able set the day back on track. This sort of reconciliation is not unusual in our house. My spouse and I often role model apologies to our kids and to one another. We openly admit our own mistakes when they inevitably happen. And we insist on the same respectful, reflective behavior from our kids. Let me be clear, we don't force apologies in my house. We don't force forgiveness. We do make one step mandatory: we insist they take a moment to listen and consider what their disagreement looked like from the other side. Members, visit our Exclusive Downloads Collection to print conversation cards for this story. The art of reconciliation requires strong empathy muscles. Both apologies and forgiveness require us to mindfully consider a situation from the other person's perspective, what we at DGT call "practicing a 180." Let's not wait to teach kids to apologize in the heat of the moment. Let's not bully them into rushed or sarcastic apologies. And let's not wait for a big bad traumatic event that requires a huge apology. Instead, using the tips below, let's teach the basics: I understand. I'm sorry. I forgive you. Start your conversation with The Forgiveness Garden by Lauren Thompson, a parable that shows us how reconciliation saves everyone. What is an apology? According to Carl Schneider in Mediation Quarterly, it's a regretful acknowledgment of an offense or failure. With young kids, their offenses are small, but relatively frequent, giving us lots of excellent opportunities to practice meaningful apologies. Practice doing a 180 by considering how the other person experienced the situation. Listen to what they have to say. This key step builds up our capacity for empathy, by forcing us to see a situation from someone else's point of view. "How would I feel about what happened if I were them?" "What would I have been thinking/feeling if I were them?" "What was it like to be them in that moment?" "What could I have done differently that might have made things work better?" 2. I understand [how this was hurtful]. And I'm sorry [for that thing I did]. Once you are aware of your impact on another person, the actual apology is a bit easier. For example, when my daughter takes the time to consider how long her little brother has waited for her to play with him, she truly does regret kicking him out of her room. She still feels strongly that she needs some alone time, but she is gentler with him. She gives him something to look forward to like "After dinner we'll go outside" or "In fifteen minutes we'll play Legos." Acknowledge that you understand their perspective. Offer to right your wrong or act differently next time. Avoid the sorry-not-sorry approach. Never use the word but, as in, "I'm sorry you felt that way, but..."
3. Can you forgive me? Asking for forgiveness directly is a simple but very powerful way to take ownership over your actions. It's a humbling request to make. And it signals to the other person that you regret your mistake. What is forgiveness? Forgiveness is a deliberate, intentional choice to let go of anger and resentment in order to move forward, according to the American Psychological Association. 1. Pause. Speak your truth. Listen. Reflect. "How would I have felt in that moment if I were them?" "What could they have done differently?" "How do I think they are feeling now?" "What is it like to be them?" 2. I forgive you. Or I'm not ready. When you hear an apology, you have two choices in my house. To forgive, or to take some time. Often, "I forgive ya" tumbles out without a great deal of thought as they resume whatever game they were playing. It's okay to say, "I'm not ready." It's okay to take some time to reflect or take a walk. Take care to revisit your forgiveness a little later. In my house, a few minutes usually does the trick. 3. Choose to let go and move on. Not every hurt is quickly fixed. Forgiveness does not mean you approve of what happened. Forgiveness is the intentional decision to set aside negative feelings about an incident and move forward. The final step then, is to make an effort to let go of the grudge. More often than not, once people have taken the time to understand each other, apologies and forgiveness naturally follow. And every time we practice thoughtful reconciliation, as parents or children, our empathy muscles grow a bit stronger. It's crucial that we teach, role model, and practice apologies, along with forgiveness, so that when our inevitable, human mistakes happen, we have the skills to mend what's broken. And when heavier, more heart-breaking transgressions hit us, we have some idea about how to respond. Browse more tips and tools to parent with purpose. Join our Big-Hearted Families Membership Circle! We'll help you keep kindness on your family calendar all year long.